The hibiscus continues to put out new blooms daily. This window is framed in tropical beauty....roses, palm tree and bouganvillea. Oranges and grapefruit are getting large and inviting! I don't know the name of these; there are lot's of them in the back wild part of the property. The camphor trees are dropping some leaves and ripening their berries. Along the north boundary of our yard, there grows the most beautiful moss. It grows in several places along our worm fence line. Also neighbor to the moss is this lichen. The drought doesn't seem to be bothering this plant. Our Maple trees are acting like it is Autumn even if our temperatures do not. I couldn't resist this additional shot of the lichens. The Dogwood tree is just beginning to yellow. I hope you enjoyed your visit to this Northeastern part of Florida! Use this link to visit all the others who join in this monthly tour. Have I mentioned how much fun it is to spin variegated roving! The yellow/blue and white blended beautifully and while there was no green on the roving, they have given the impression of greens when plied. Just look at this yarn! 280 yards of sock weight Merino/silk blend. It was such a pleasure to spin this. I dyed 100 grams of merino/silk roving from KnitPicks in blue and yellow. I will be spinning this tomorrow! The second mohair scarf if off the loom! It has its very own look and I thoroughly enjoyed the process. Just ask in the comments and I will gladly email you the PDF for this pattern! Wouldn't this look great in pink for the breast cancer awareness ribbon (bow)! Bill got the system all hooked up for the pool's solar heating! He connected all the pipes and valves and flipped the switch! 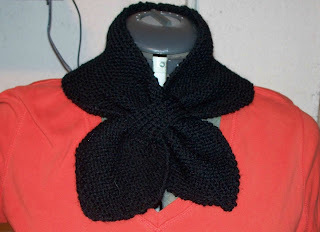 I finished the little neck scarf! Very soft using Lion Brand sportweight yarn on #4 needles. I will link a pattern tomorrow if anyone wants......the actual written pattern from Martha Stewart's Living magazine was way more complicated than it needed to be so I rewrote it for us! I got all my golden cloth cut up and some of it sewn up but I need the hardware to be able to continue with the backpack construction! I sewed up two halves of the fabric so it was wide enough for the pattern piece. I fused heavy iron on interfacing before I did any cutting. It worked very well! PuffDaddy enjoyed a new screensaver-downloaded just for him! I had some knitting time with friends this afternoon and we tried out a new pattern together. Do you see the bag of pretzel M & M's? Reward for conquering the hard parts of the pattern! We work well with a carrot on the end of the stick! We had all chosen some black yarn and remembered why you need a LOT of light to be able to see your stitches with black yarn!!! We decided that the pattern will be used again but the yarn color will be changed! 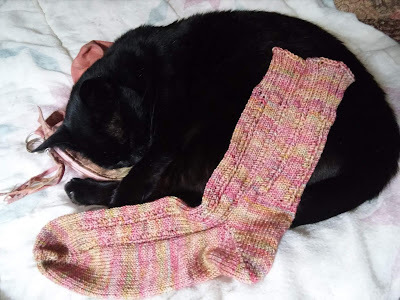 I will show you the finished scarf soon. Or should I say, sashy......as in all 30 are pressed and ready for the post! Yippee! Graduation sashes as modeled by my dressform! Yup, the stripes go horizontal when using the novelty yarn as weft instead of in the warp. Note to self-- Pretty but I do like the vertical stripes better. I finished the mohair scarf! What a perfect accessory for this Autumn! This has the novelty mohair as warp and plain mohair for weft. I dyed some roving from KnitPicks; this is the superwash wool with nylon that will work up for socks. I haven't spun anything but natural color in such a long time this will be fun. (Oh, yeah, I did do the mystery wool but that was a batt and not roving.) Candy canes anyone.........? I did reach my goal to turn all 30 sashes inside out today. This is a pic of the cats watching the PBS Nature show last night. I caught the shot when there were no crows on the actual screen but that is what they were both trying to catch just seconds before I snapped this. They were very entertaining watching and listening to the crows and even looked behind the tv to find them! I pulled the plant fiber samples off the loom, serged the ends and took this picture then tossed it in the washer. I finished clue two of the mystery shawl. This is about 12" now at the spine of this semi-circlular shawl. Next, I warped up some of the mohair I got in NY on the rigid heddle loom. I placed the colored yarn on the warp and am using plain brown for the weft. I think there is another skein of each of these so I can reverse it for the next scarf-just to see how it would change the outcome. When the cloth came out of the dryer, I could see that the use of different fibers produced an uneven shrinkage rate I hadn't forseen. Since this cloth was going to be used for pillows, I just made them smaller than I originally planned but if I had wanted a tablerunner, I would have been sorely disappointed! Live and learn. Three 12" pillows now reside on the couch! I like the new way to display the yarn! is an annual sewing job for me. Nyki helped me with the various steps, always checking my progress. I cut them out and sewed them all today and will finish these on Monday trimming and turning them all right side out and on Tuesday, they will all need pressing so I can mail them out. Bill was up on the roof today, installing his latest find from Craig's List; solar panels to heat the water for the pool. He got 5 of the 7 panels installed before I called him in for dinner. The nights have been cool (53F) which has cooled the pool down to around 73F, which means it is too cold for us to swim. The days are still very comfortable at 88F so we will use the daytime sunshine to bring the temp up in the pool-hopefully to around 80F so we can swim again! Well, that is the plan anyway! A Finger in Every Pot!